Let us guide you through the process of selecting the best SharePoint Analytics tool for your business. SharePoint is undoubtedly a very helpful and flexible information management solution. For many reasons, like variety of licensing options and scalability to name a few, it can easily satisfy the demands of small- and mid-size companies as well as enterprise-level organizations with up to 50,000 users browsing intranet pages on a daily basis. Microsoft’s intranet tool also allows users to take advantage of centralized administration, and to benefit from retaining control of the platform by changing general application settings and using the hassle-free Configuration Wizard. What’s more, the solution is really customizable. It’s quite easy to build personalized applications on top of the out-of-the-box tool and white-label it to use your own visual identification. That’s probably why it has become the tool of choice for around 80% of companies on the Fortune 500 list, including such renowned businesses as Nestle, UPS, Monsanto, Kraft Foods, and Viacom. Impressive, right? That said, there’s one major functionality it doesn’t offer. This functionality is proper analytics. Although every upgrade of SharePoint comes with more advanced analytical metrics, there’s still not too many things you can measure using the reports available out of the box. With the default SharePoint Site analytics, you won’t be able to track your user’s click paths, check the duration of each session,attribute goals to events, or divide your users into segments – the things you typically do with your web analytics. And it’s quite difficult to learn what your employees are up to without those tools in hand. No wonder that the 2015 AIIM report “Connecting and Optimizing SharePoint – important strategy choices” showed that nearly 50% of SharePoint users struggle with maximizing the utility of their intranet tool. But you don’t have to follow their example. You just need to find a better way to measure the performance of your digital workspace, and this is where a dedicated SharePoint Analytics solution comes in handy. If you’re still not convinced why investing in a SharePoint analytics tool may be your best move, we encourage you to read this blog post. 1. Run-of-the-mill or SharePoint-dedicated solution? You may consider tracking your intranet traffic using your regular web analytics solution. After all, it’s much cheaper and easier to stick to the tool you already have. Unfortunately, in the case of intranet analytics, this might not be the best option. Of course, you can always try to configure your regular web analytics tool to fit SharePoint. But you have to remember that your intranet space – unlike your website or mobile app – is not about selling or advertising your product. Thus, standard web analytics metrics won’t apply to the SharePoint environment. Goals (e.g. deleting, adding, and editing documents or your custom goals). What’s more, you can’t take advantage of many additional functionalities easily providing even more valuable information on your intranet users’ behavior. For instance, in Piwik PRO we have designed a very helpful feature called Organisations. This feature was developed for the European Commission, and is a great fit for every company looking to analyze the location of visitors within their internal network. It gives you an additional dimension to segment your web analytics reports by the location of intranet users. Pretty useful, huh? So, if you want to squeeze the most out of your intranet tool, we advise investing in analytics created typically for SharePoint. 2. Which version of SharePoint are you using? This question is particularly important, because among the dedicated SharePoint analytics tools there’s no one-size-fits-all solution that will go with every edition of SharePoint. So, unfortunately, if you decide to go for a native intranet analytics tool, you still have to be careful what you choose. Some of them only support the latest versions of SharePoint, while others only work with older ones – particularly since those are two separate products based on different software: SharePoint 2013 or SharePoint 2016 and Office 365 are app-based solutions, while SharePoint 2010 and older versions use the more performance-heavy wsp. farm solution. How can a bad analytics tool skew your data? In the case of SharePoint based on wsp. farm and enterprise-level organisations, it’s a common practice to minimize server load by applying the so-called Minimal Download Strategy. This serves to reduce the amount of data that the browser has to download when users navigate from one page to another within a SharePoint site. You can read more about it at the Microsoft Dev Center. Unfortunately, the side effect of this strategy makes it a sort of throwing the baby out with the bathwater. Since MDS (Minimal Download Strategy) prevents pages from being fully downloaded, it can automatically disrupt your analytics tracking codes from loading correctly and significantly skew your intranet analytics data. Luckily, dedicated SharePoint analytics solutions “know” how to work around this issue. In the Piwik PRO SharePoint Analytics Feature for SharePoint 2010, tracking code is located in the line of code which is always being downloaded, regardless of the Minimal Download Strategy being applied. As you can see, going for SharePoint Site Analytics crafted to the needs of your version of intranet software is rather important. And it automatically narrows down the list of vendors to choose from. There are also separate tools dedicated for SharePoint on-premises. And if you want to know why so many multinational enterprises decide to go for this option, you should definitely read the answer to the question #4. 3. Log Analytics vs. JS tracking? Let’s review what those two tracking techniques have to offer. As you probably know, those kinds of data cannot be acquired with web log-based analytics. And if you’re not familiar with this topic, you should check out this blog post in which we present the pros and cons of those two tracking techniques. So who should choose web logs? You must be aware that JS tracking isn’t suitable for everyone. Why not? Because some entities may need to use less advanced tracking methods (web logs, for instance) in order to fully comply with strict security regulations and industry-related restrictions (like PCI or the Sarbanes-Oxley Act in the case of banks and financial institutions). Firstly, web logs are hidden deeply in infrastructure, and their formats vary depending on the pieces of information you decide to record. That makes working with them quite difficult and cumbersome. Secondly, you should remember that data collected from web logs is rather basic. After all, the purpose of web logs is to collect server activity, not business insights. Although it’s possible to enrich web logs with additional information about your users (like department, user name, or job title), you have to be careful not to capture any kind of data that falls within the definition of PII. Be careful about collecting PII because it’s extremely risky, especially in the face of the upcoming GDPR legislation – a total game changer for every company doing business in EU (if you’re not sure what we’re talking about, we advise you to read our blog posts and 2-part interview with Aurelie Pols, an expert on data privacy and security). With sensitive data in your web logs, you expose yourself to fines and other repercussions. So it’s better to be safe than sorry and not to monkey around with the type of information you collect in your web logs. So, as we’ve already said before, to avoid storing sensitive data in your logs and still benefit from having an abundant collection of data about your employees, you may want to stick to tools that allow you to use JS tracking. Let us show you how it works in the Piwik PRO SharePoint Analytics Feature. To apply the highest security measures to the process of collecting data, we isolate the front end (the data receival endpoint) from the back end (the server holding the data). In this way browser requests are separated from the safe storage space of your analytics data and sent to the Piwik PRO On-Premises instance at specified time intervals (depending on your own preferences). It’s important to stress that the location of an analytics installation is always based on the constraints resulting from your company’s internal security policies – you can decide to store it on your own servers, at a third-party data center, AWS, or on Piwik PRO infrastructure. This decision is totally up to you. All that provides you with top-notch security and 100% ownership of your SharePoint Analytics data. The other thing that you should definitely consider is pairing your SharePoint Site Analytics tool with a powerful Tag Manager. Especially if your intranet farm consists of hundreds of pages and highly diversified content. Let us explain why. Although some information acquired using Tag Manager can be gathered without taking advantage of this tool, it’s really hard to overestimate the convenience that comes along with adding a tag management system to your toolbox. As the tracking tags wouldn’t have to be added to every single page of SharePoint, it will appreciably speed up the process of collecting intranet analytics data. And all that without compromising on the depth of information you obtain (as you would in the case of web logs). Collecting data with Tag Manager will allow you to create extremely valuable reports using as many segments as you like, and also to observe the behavior of your users in real time without spending extensive resources digging into your intranet’s website code. So if you want to facilitate your intranet analytics efforts, using a tag management system is definitely something you should give a try. And if you want to learn more about the capabilities of Tag Manager, we advise you to visit Piwik PRO’s TM website, along with the dedicated section on our blog. 4. Do you want to store it On-Premises? There’s plenty of reasons why you should. Another big decision regarding your intranet analytics tool is where you want to have it – in the cloud, on your own servers, in a third-party data center, or maybe somewhere else? If you already store your intranet tool on your own servers, you probably know why this might be the best way to manage your employees’ data. If not, we’d be happy to provide you an overview on this topic. At first glance, cloud-based solutions may seem a good place for keeping your intranet analytics instance. They’re easy to access, arguably safe, and using them generates low (if any) costs. But nothing comes for free (at least not in that case). Firstly, you’re surely aware of the fact that collecting and analyzing personal data in the cloud is a rather delicate subject. That’s why most cloud analytics vendors structure their Terms of Service in a way that forbids you from storing any Personally Identifiable Information (PII) of your users on their servers. It means that you’re not allowed to gather information on usernames, email addresses, IPs, or virtually any other kind of data that can be linked to an individual. For that reason, you have to take advantage of some kind of anonymization technique to get rid of potentially troublesome data and fully comply with the ToS of your web analytics vendor. But at what cost! You’ll lose valuable information that would serve to create in-depth reports measuring the performance of your intranet tool. Read this blog post to learn more on the pros and cons of storing your web analytics data in the cloud. So, if you want to benefit from high-level insights on your employees’ intranet activities without the risk of violating your SharePoint Analytics vendor’s ToS, going on-premises might be the best option for you. Secondly, with cloud-based analytics, you typically don’t have influence over where your data is being stored. And the chances are high that the location of your web analytics vendor’s servers won’t comply with the data privacy laws of countries you do business in (to learn more about this topic, visit this blog post). For instance, if your company has a branch in any EU Member State, you’re obliged to store data acquired from local intranet users within EU borders (and if you operate in Germany, you’re not allowed to store your employees’ personal data at all!). Unfortunately, most cloud-based web analytics vendors – including the most popular one – have their servers located outside the EU, so it automatically eliminates them from the mix. 5. Do you need to apply any additional security measures? Providing top security of your data is not only about choosing the safest servers for keeping information about your employees. It’s also the art of deciding what information you want to collect and which users will be granted access to particular reports and stats concerning the performance of your intranet tool. To apply even stricter privacy measures to collected data and avoid violating your internal data security policy or local data privacy laws, it would be very helpful to be able to predefine which types of information you wish to collect and pass to your intranet analytics. The right SharePoint Analytics tool should allow you to choose how detailed your intranet reports are and how much information on your employees you want to obtain. And you should definitely avoid tools that don’t give you the option to predefine the amount of information on your users you want to collect. You can also take advantage of custom scripts and add other characteristics to provide even more depth to your SharePoint Analytics reports. Intranet analytics can become a valuable source of information for many departments in your company, including human resources, employer branding, marketing, finance, and even senior management. But, for many reasons – such as your company’s data security restrictions – you may not be able to share all the reports and stats created by your intranet analytics tools with everyone. That’s why advanced permission settings would prove really useful in providing high-level data security. 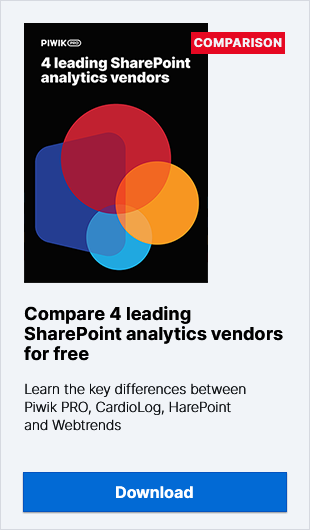 Some SharePoint Analytics solutions allow you to choose which users can see particular reports (like HarePoint Analytics), while others with less specified permission systems allow you to grant your users access to the analytics data of entire site collections (like in Piwik PRO). As we’ve already said, the need for a more granular access policy will depend mostly on your own internal requirements. In some cases, the more advanced permission system the better, but in other scenarios this feature might not be so essential. We hope that the list of questions presented above will prove useful in your journey to finding the most suitable SharePoint Analytics solution for your business. We’re also aware that we’ve just barely scratched the surface of the topic, as there are other things you may want to consider when seeking a tool to analyze your digital workspace performance – like servers capabilities and other technicalities.